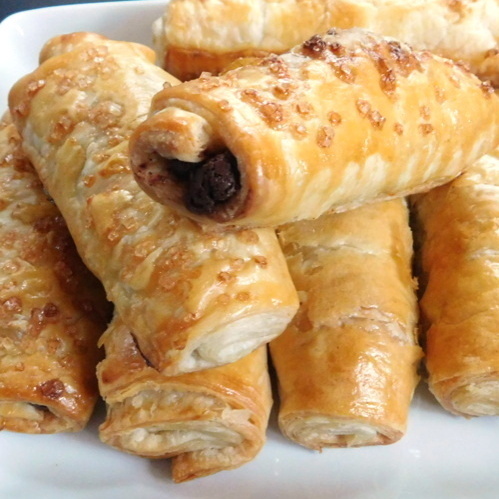 Lazy Pain au Chocolat - Get the Good Stuff! You might call it a chocolate croissant. You might call it pain au chocolat - chocolate bread. It's absolutely delicious, and if you take a little shortcut, dead simple to make. Once in a while you can be lazy in the kitchen! Be sure to thaw the puff pastry according to package directions. A good butter-based puff pastry is the secret to lazy pain au chocolat! Heat oven to 400˚F (200˚C). Lay out the sheet of thawed puff pastry. Beat the egg with a little water; brush this over the entire surface of the pastry sheet. Depending on the size of the pastry sheet, cut it into 8 to 12 rectangles about 3 inches by 4 inches (7 cm x 10 cm). Place a chocolate stick about 1/2 inch from one of the short edges of each rectangle. Note: I keep chocolate sticks like these in my pantry, because they’re just so handy. If you don’t have any, use good quality chocolate chips. Put a line of chips at the edge of each rectangle. Flip the smallest part of the pastry over the chocolate, then place another chocolate stick (or line of chips) right next to that, and finally fold the rolled part over the second line of chocolate. You’ll end up with a double roll of pastry and chocolate. Place each roll, seam side down, on a baking sheet lined with parchment paper. Brush the tops of the rolls with the egg mixture and sprinkle each with a bit of sugar for sparkle and browning. Bake 10 minutes or so, until the pastry is puffy and golden. Let them cool a bit before eating!